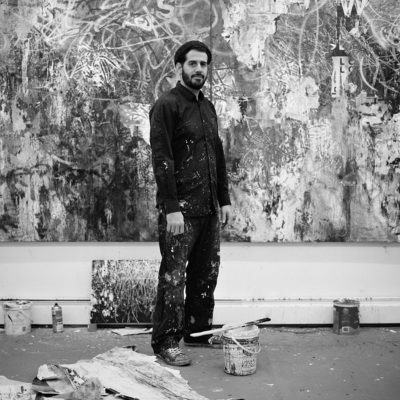 José Parlá’s paintings are composed from several distinct types of source material: the purely abstract (painterly) dabbing, gesture and layering of paint; collaged materials and detritus from the streets of the world (and that may include type or other writing and images); writing, which is easily the dominant material of these works, filling and often obscuring its contents in successive layers. Rarely is this written material actually fully legible in any of his works, usually it lies at the boundary between abstract marking and calligraphy, complicated and obfuscated by the palimpsest process he employs throughout. WHAT WOULD THE TITLE OF YOUR AUTO-BIOGRAPHY BE? Coñooooo! WHAT CAN’T YOU TRAVEL WITHOUT AND WHY? Can’t travel without my Leica M8, I love the pictures I’ve taken with this camera more than any others I’ve worked with. WHERE IS YOUR FAVORITE TRAVEL DESTINATION? Cuba is my favorite destination because with each breath I discover more about who I am. IF YOU COULD CHOOSE ONE PERSON TO SHOW YOU “THEIR NEW YORK CITY”, WHO WOULD IT BE? If I could travel back in time, it would be Celia Cruz’ New York in the 70s..
WHAT ARE YOUR FAVORITE BRUNCH SPOTS? Vinegar Hill, Chez Oscar, Junior’s..